Accuracy varies across demographic groups. In general, younger Americans tended to provide more accurate responses than their older counterparts: 27 percent of 18-24 year olds correctly identified Ukraine, compared with 14 percent of 65+ year-olds. Men tended to do better than women, with 20 percent of men correctly identifying Ukraine and 13 percent of women. Interestingly, members of military households were no more likely to correctly locate Ukraine (16.1 percent correct) than members of non-military households (16 percent correct), but self-identified independents (29 percent correct) outperformed both Democrats (14 percent correct) and Republicans (15 percent correct). Unsurprisingly, college graduates (21 percent correct) were more likely to know where Ukraine was than non-college graduates (13 percent correct), but even 77 percent of college graduates failed to correctly place Ukraine on a map. The proportion of college grads who could correctly identify Ukraine is only slightly higher than the proportion of Americans who told Pew that President Obama was Muslim in August 2010. The further our respondents thought that Ukraine was from its actual location, the more they wanted the U.S. to intervene militarily. Even controlling for a series of demographic characteristics and participants’ general foreign policy attitudes, we found that the less accurate our participants were, the more they wanted the U.S. to use force, the greater the threat they saw Russia as posing to U.S. interests, and the more they thought that using force would advance U.S. national security interests; all of these effects are statistically significant at a 95 percent confidence level. 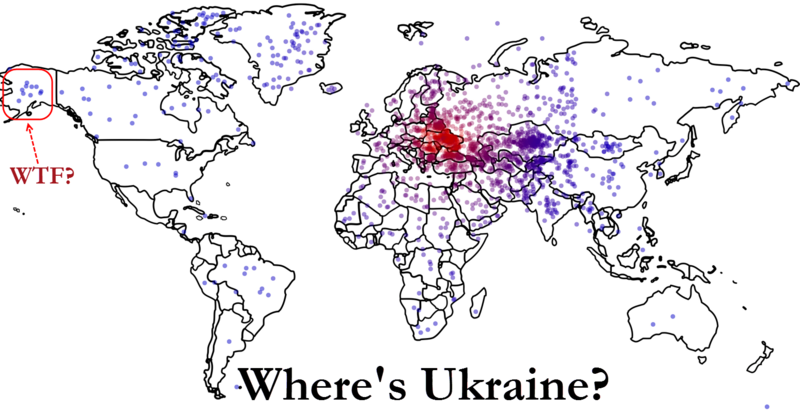 The less people know about where Ukraine is located on a map, the more they want the U.S. to intervene militarily. Anyone who has studied Russian History knows where the Ukraine is located. Until Chernobyl, it was a rich area to grow crops, now many pipelines run under it. Russia needs the Ukraine because of the waterway access it provides. American has become so full of the ignorant…….it would be easy to locate…’People, this is more sound and fury signifying nothing.